In medical terms, most health conditions have clear definitions. But only people living with chronic illness know what it really feels like to live with it — and making others understand can be a challenge. 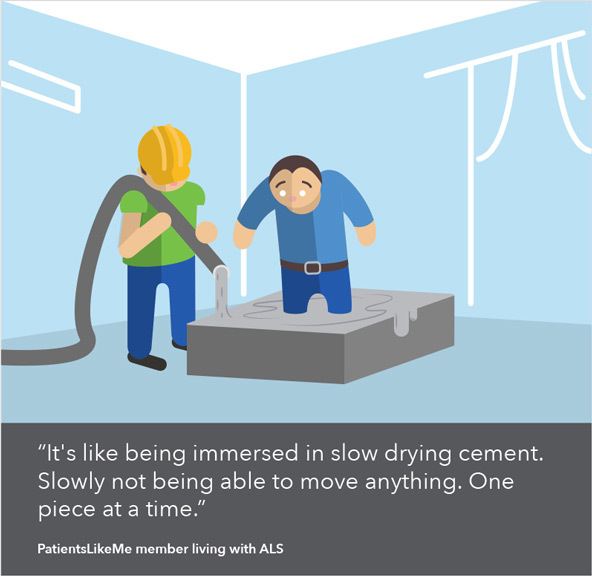 When we asked some PatientsLikeMe members to explain what life was like with their condition, their responses painted vivid pictures of what they’re going through. 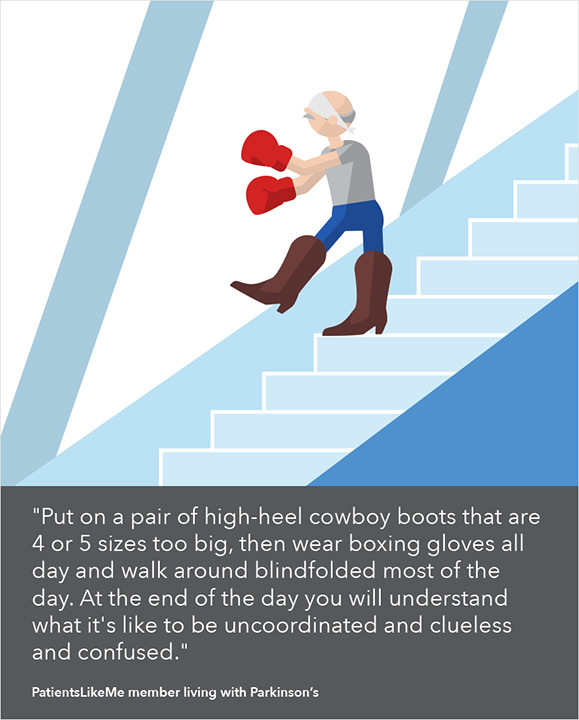 So, we asked PatientsLikeMe User Experience Designer Kristina Ng to turn those descriptions into illustrations. Depicting life with lupus, multiple sclerosis, mental health and more, Kristina’s illustrations sparked a discussion in the PatientsLikeMe community. Interested in seeing the rest of this illustration series? Join the PatientsLikeMe community and view the rest of the images in the forum. What kinds of complementary treatments can help people with Parkinson’s disease (PD)? PatientsLikeMe blog partner Karl Robb recently shared with us about his complementary therapies of choice: Reiki and Qigong. Karl has been living with young-onset PD for more than 30 years and practicing Reiki for nearly 20 years. He and his wife, Angela, are the couple behind the PD blog, “A Soft Voice in a Noisy World: Dealing and Healing with Parkinson’s Disease,” and authors of two books. Karl – who went from “huge skeptic” to Reiki master and Qigong practitioner – acknowledges that practices like these may sound “too far out” at first, but he breaks down which symptoms they’ve helped him manage (along with taking prescribed treatments). Can you fill us in about Reiki and its potential benefits? Simply put, Reiki is a very old complementary therapy that can assist the body to help itself through light touch. Reiki incorporates the use of the energy that is all around us. Reiki involves the placement of hands on different areas of the body to direct energy to release tension, reduce stress, lessen discomfort, and enhance well-being. A trained Reiki practitioner learns to transfer this universal energy through his or her hands and allow that energy to help assist the recipient. There are two ways you can experience the benefits of Reiki: You can receive a session with a certified Reiki practitioner or you can take a class to learn to perform Reiki on yourself. Reiki is very much like explaining an emotionally moving photograph, a sunset, a song, or a work of art; you can talk about it all you want, but not until you experience it for yourself can you fathom the raw power that it can offer. When I first learned about Reiki, I knew absolutely nothing about what it was. The truth is that Reiki fell into my lap, much to my benefit. I don’t have any problem with skeptics, because I was a skeptic. When someone starts talking about the concept of universal energy or energy being transferred from one to another, it sounds too far out to comprehend. Once I tried it, I was hooked! I was a huge skeptic, until I tried it, experienced the results and saw dramatic changes. I took a leap of faith and trusted in my practitioner, a former Army Ranger, who is now one of my dearest friends. Since my first Reiki treatment, Angela (who was also an admitted skeptic) and I have both become Reiki masters (completing three levels of training plus a fourth level of a one-year Reiki Mastership program), so that we can share and teach Reiki. I write a lot on my experiences with Reiki and encourage anyone and everyone to experience it, at least once! What is Qigong? When did you learn it and why? Qigong is an ancient form of moving meditation, similar to Thai Chi. The Reiki that we learned, Reiki Jin Kei Do, in January 1999 is composed of three parts: A six-movement Qigong, mindfulness meditation, and a hands-on Reiki self-treatment protocol – which all promote self-care. The first degree of Reiki is all about taking care of yourself. Often, after you learn the first degree, you have less need to receive sessions from your Reiki practitioner, as you can do much of the treatment on your own. I find that Qigong brings me peace and a sense of calm, improves my balance, increases my strength and centers me. The six movements are quite easy and can be done standing or in a chair. Qigong helps me to feel more energized and clear of mind. How does Reiki help your Parkinson’s symptoms, in particular? I am confident that if I hadn’t learned about Reiki and incorporated it into my life, I would be much worse off than I am today. I use it to keep myself calm and relaxed, reduce or stop dyskinesia, clear my head, keep balanced in my mind and body, and even get a good night’s sleep. The first session that I ever had not only improved my walking, relaxed me, put a smile on my face, and made takeout Chinese food taste the best that I can remember it ever tasting. For me, it improved almost all aspects of my illness. I give myself Reiki almost every day. Sometimes in the morning I place my hands on my stomach and breathe to start the day with some Reiki. I use my breath and Reiki to help myself, if I experience dyskinesia. At night, I may do some of the Reiki self-treatment to fall asleep. Just as everyone’s Parkinson’s is different, you may find your experiences with Reiki are different than mine. Discovering Reiki and other complementary therapies can be a very pleasant experience with minimal risk, have real benefit, and leave you with a daily practice that makes a lasting impact. What advice do you have for people considering a complementary therapy for the first time? Don’t be afraid to try something that might be out of your comfort zone, like Reiki. Just be cautious, smart, and willing to give it a chance. Some Reiki practitioners may be willing to offer a brief session at a discount to let you experience it and see if you like it. Make sure that your practitioner does their own daily self-practice and that they have some experience with people with Parkinson’s disease or your related health issue. Referrals are always a good way to find your Reiki master. How often do people do Reiki? What other complementary therapies are helpful? You and your Reiki master must work out a schedule that works best for you both and one that you can afford. A Reiki session can last from 15 minutes to 1.5 hours and a session usually can be close to the equivalent to the cost of a massage, depending upon where you live. Most providers do not take insurance. Reiki may not be everyone’s cup of tea, but what I do write repeatedly is that you must look for something that works for you and excites you! Massage, yoga and meditation are just three wonderful ways to get started and exposed to a therapy that may open new doors that you might not have experienced before. You may find classes in your area that are devoted to people with back issues or mobility challenges. 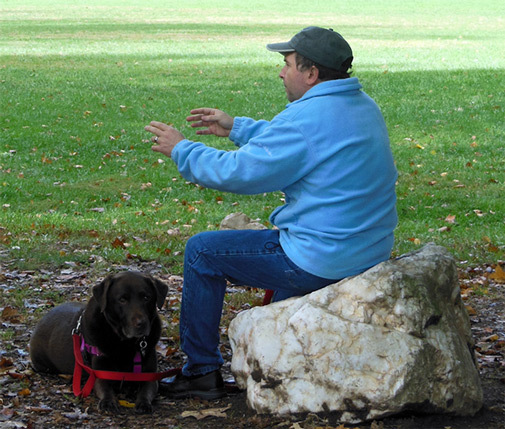 Look locally for adaptive yoga to find a class that may cater to your needs. Some instructors may come to your home for an added fee and some may have studios near you. I wish you the best on your path to health and wellness. See what PatientsLikeMe members are saying about Reiki and Qigong, and join the community today to learn and share more about complementary therapies for your health condition.